Artists in the Country started in 2001, when Ann, Michelle and Lauren decided to use their land to host artists, and raise money for children with autism to attend camp at Eden Institute's Camp in Chaplin CT. From 2001 to 2008, money was raised for the camp, and about 18 children with autism from CT received scholarships to enable them to attend one week of overnight camp. About $35,000 was raised for Eden Institute Camp in Chaplin, CT. 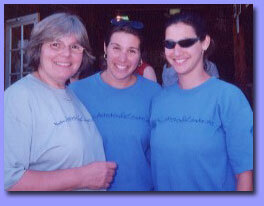 Starting in 2009 until 2015 monies have been raised for Camp Quinebaug in Killingly, CT. This local day camp for children with autism and other special needs has received about $5,000 from the silent auctions and raffles at the show. "Artists in the Country has hosted 4 musical showcases with bands playing in OCT, as well as Open studios for several years. For the last 12 years Artists in the Country has hosted a Spring Collaborative for artists to show their work in a gallery type setting for four weekends in the Spring." "A Day of Music for Victoria Soto Scholarship fund at Eastern CT State University was held in June, 2013 and raised 1700+ for the scholarship fund. Victoria Soto was a first grade teacher who was killed in the Newtown CT tragedy on 12-14-12. The scholarship fund was set up for her at Eastern Connecticut State University, Willlimantic, CT, where she went to college to become a teacher." Ann Chuk: the creator of Artists in the Country, has been a Speech Pathologist for the public schools since 1972. Ann has worked for many years towards including children with special needs into regular classroom environments and to build their communication skills with their peers. Ann has her 6th year in the field of Assistive Technology, which builds on her ability to help children learn in the regular educational classroom through the use of assistive technology tools when needed for learning to communicate. Ann has done workshops and consultations for families and teachers. In 2010, Ann retired from full time teaching in 2010, then worked part as a Speech Language Pathologist in Ashford, CT and Norwich CT for a year. She presently works part time in E. Hampton, CT. at Center School. Michelle is working in the field of Public Health in Washington, DC. She presently also sings with the Congressional Chorus in DC and also has loved and been involved in “the arts” since childhood. She sang and acted in many shows throughout elementary school and through high school. She played flute in her school orchestras. In college, she participated in several choirs and acapella singing groups. After graduation, when living in a new city, and missing singing and playing the flute, she co-organized an acapella group called Vocal Therapy which sang in the D.C. area for two years. She is a valuable asset to the Artists in the Country family endeavor. Lauren is a teacher and basketball coach in Worcester, MA. She plays a vital role in the success of Artists in the Country. Her contributions include, but are not limited to the creation of the program guide, landscaping of the barn, and many hours of preparation. Throughout high school, although mainly spending her time on the athletic fields for basketball, soccer and softball, she also showed interest in the arts. She played saxophone, and continued with art classes in high school. As a senior project, she did a wall mural in the music hallway of her high school, which still can be seen today and she continues to make murals on walls in VA, and Worcester, MA. Woodstock is only 50 min. from Hartford/ Providence, 90 min. from Boston, and 25 minutes from Sturbridge/Worcester. Woodstock is a great place to discover during every season, ESPECIALLY in the fall. Bring your sketchbooks, and stroll around the pond and barn. Bring your picnic lunches, friends, and family and enjoy a beautiful day! Ann, Michelle, & Lauren welcome you. We were on the radio on 9/20/10, check it out here!